2018 was a strong year for business development, thanks to collaborations with our counties, JobsOhio and many other partners necessary to economic development work. APEG business development metrics* were considerably higher than the last several years, and four large projects (with over 100 jobs each) was a major contributing factor. Advanced Manufacturing accounted for 42% of metric wins, with food ranking second at 21%, and Auto and Shale/Petchem tied for third at just over 10%. 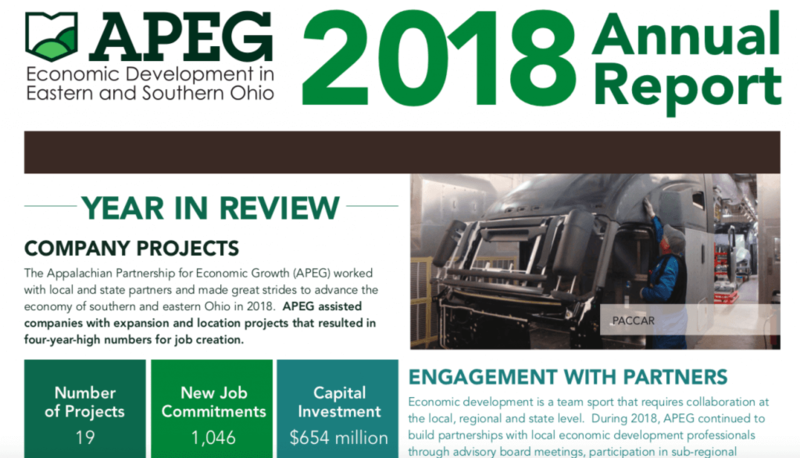 The APEG region competed for a near record number of site searches (69) and experienced more projects conducting site visits (12) than ever previously experienced. BREs resulted in 8 metric wins (42% of wins), 11 pipeline projects (25% of the monthly pipeline average), and 12 leads (37% of leads generated in 2018). Shale & petrochemicals still account for the majority of projects in the Project Pipeline (34%). Shale projects have long design, permitting and financing lead times. Shale projects are tending to linger in the Pipeline and are slow to close. Advanced Manufacturing is a close second at nearly 27%. Automotive ranks third at nearly 10%. For a downloadable version of the 2018 Annual Report, go here. Metric Wins are completed projects. Pipeline projects are active projects we are working to complete. Leads are early stage project possibilities without new jobs numbers and/or decision timelines in excess or two years.